"This gemstone was desinated Imperial in the honour of a Brazilian Emperor." 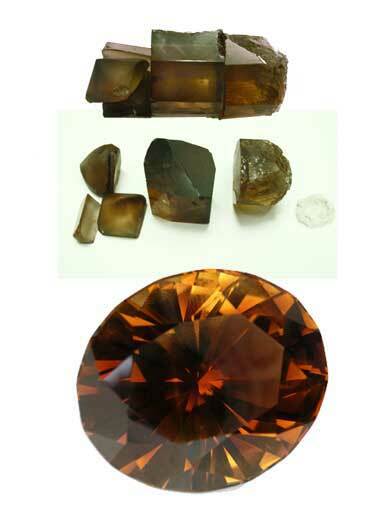 "The value of a 3ct size Imperial topaz of jewelry quality is approximately $1200 for the stone alone." The 1st photo shows the stone, (the middle piece) in it's rough form, cut from a singe crystal weighing 995 ct. The 2nd photo shows the next stage of it's life, as Day Gems craftsmen preform the pieces. The 3rd photo shows the gem in its final stage magnificently crafted into a fantastic jewel. Gem merchants say this brilliant cut, oval shape jewel is just that, brialliantly cut mesmarizing gem. Aproximate dimensions are follows; 34.5 x 30.0 x 22.3mm. and weight is 151.07cts. Of course this untreated gem come with a FREE lab indentification/origin report.